It adds numerous modern features that serious video editors expect. Vegas Pro 15 represents a major overhaul of the software that was originally developed by Sony but taken over by Magix. The company’s first post-sale version 14 in 2016 fixed many compatibility issues and bugs neglected by the prior owner. With Vegas Pro 15, the software is once more competitive with other prosumer video editing suites. It adds numerous modern features that serious video editors expect. The result is one of the best semi-pro video editing applications for the price. You can read about other prosumer packages, plus consumer and even free programs, in our comprehensive roundup of video editing software. Vegas offers a standard, timeline-based video editing interface, but you can also use the trim view to make selections in what would otherwise be the preview window. Import and export format support is excellent. The lineup of effects and transitions is pretty good, though we felt some of them could have been more elegantly executed. As with other video editing software, there are lots of subtle features that new users might not pick up on right away. For example, we found scrubbing through the timeline to be a bit sluggish when we clicked the playhead, because it also scrubs through audio this way. Dragging the selection line instead limits the scrubbing to video. 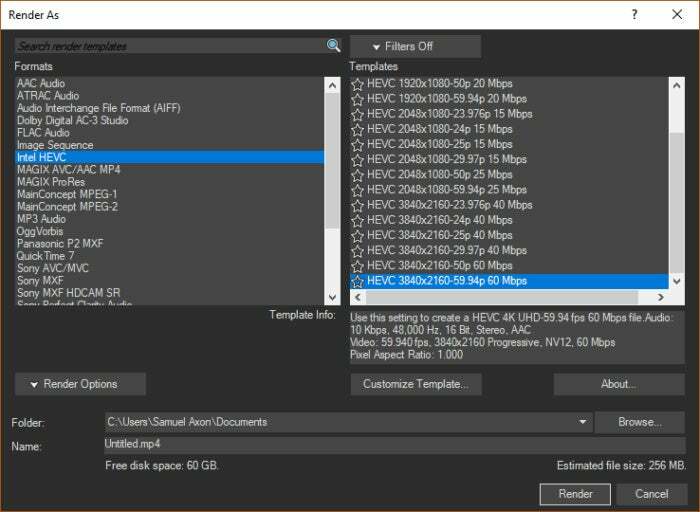 Fortunately, Vegas Pro 15 comes with serviceable interactive tutorials and a robust help database, so as pro editors go, it’s pretty easy to pick up and learn. Vegas Pro 15 offers a long list of supported expoert formats. Vegas Pro 15 has a fully customizable toolbar, so you can choose which features and settings to expose. This is always welcome, because creatives often work best without clutter. It also lets you get very deep into customizing many aspects of how it runs. For example, you can specify a maximum number of rendering threads. Nuances like this will be intimidating to some users, but experienced professionals will love it. There are very few, if any, major features prosumers might seek that Vegas Pro 15 doesn’t offer. There is 4K support, and you can do multi-camera editing. Even newer technologies like H.265/H.265 (a new video compression format used in new Apple devices, among other things) and Intel Quick Sync Video (video encoding on dedicated hardware with supported Intel CPUs) are available. Our biggest complaints were performance—it could be better—and the lack of robust media library management features like those offered by Adobe. These are small complaints about a video editing application with big upsides, though. 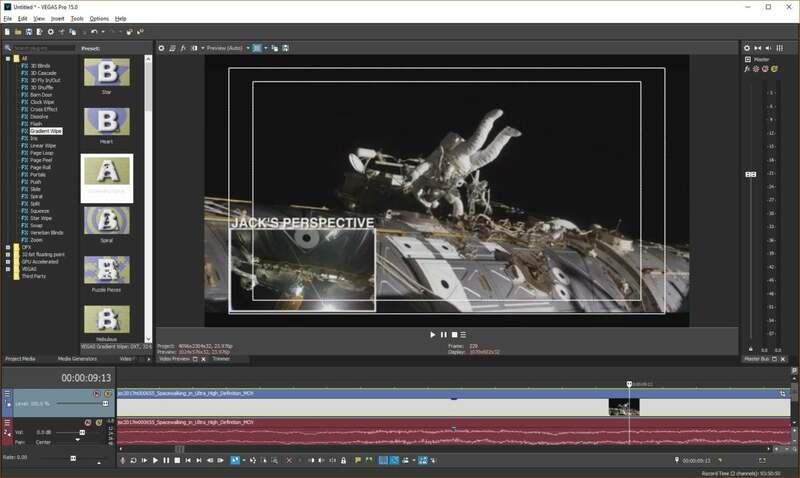 Vegas Pro 15 represents a major overhaul of the software that makes it competitive again, with an overhauled the user interface and numerous modern features that serious video editors expect. The result is one of the best semi-pro video editing applications for the price.